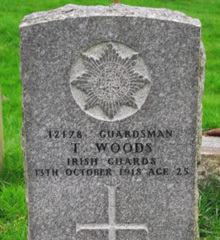 Thomas Woods was born about 1893 in Brantry, Dungannon County Tyrone. Thomas Woods enlisted in Rutherglen, Lanark, Scotland. Private Thomas Woods was serving with the 3rd Battalion of the Irish Guards when he died of wounds at home on 13th October 1918. He was 25 years old. The CWGC records Private Thomas Woods as the husband of Georgina McCarty Woods, of 132 Farmeloan Road, Rutherglen. Scotland. Rutherglen Cemetery has 87 CWGC casualties, 49 from the First World War. The Cemetery is located on Mill Street in Rutherglen, The cemetery opened in 1881 and holds records from that date.